Say goodbye to old fashioned wired outdoor wifi IP cameras. Orwind® WIFI IP plug & Play CCTV surveillance camera is here - now you don't have to spend inordinate amount of money in setting up outdoor security for your home and office. 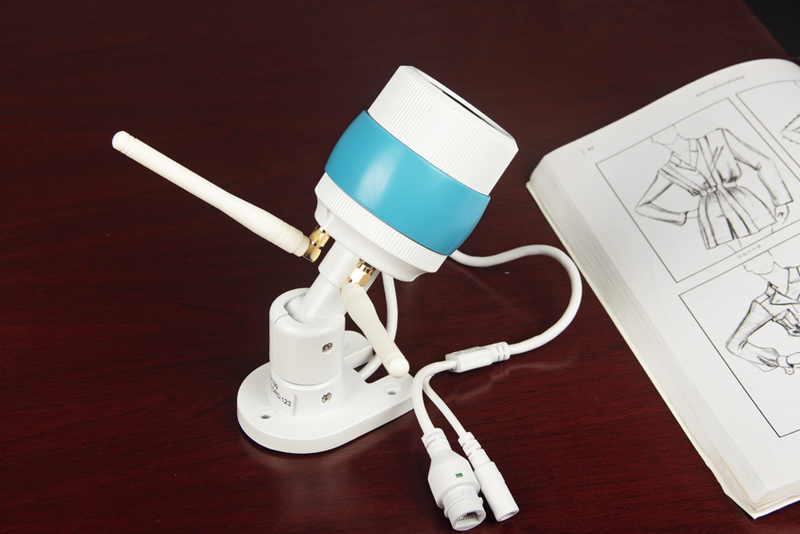 Just buy this wireless waterproof security camera, follow simple installation steps and as long as you have wifi signal reaching the camera, you set it up within minutes - with help of your regular electrician. INSTALLATION NOTE: Install the App (mentioned in the product manual). Connect wired internet with the slot. While installation make sure your mobile is near the camera, it will show 1 device detected. Select the device, enter the default password (would be mentioned in the manual). The camera should now be working. Next, tap on the'settings icon' under the camera screen, select network settings and under wired Internet, there will be wireless internet and wireless connections available (note: do not change wired to wireless). Select the appropriate wireless Internet network. This process should take 2-5 minutes and when its done, you can remove the wired internet. This camera is now ready to be used as WIFI IP CCTV Cam Note: 1. Does not support MACBOOK/AppleOS - 2. It will take upto 30 mins for the video to appear in the app after recording - PRODUCT PARAMETERS: Operating System: Windows, Sensor: 2.3M pixel CMOS, Image Code: H.264, Video Standard: NTSC + HD, Video Resolution for Recording: HD(1920*1080P), SD(960*720P), Video Resolution for Playback: 1920*10800P/30fps, Minimum illumination: 0Lux/F1.2(IR ON), Built in MIC: No, Continous Loop Recording: Yes, Storage: maximum support 64Gb external micro SD card, Network: 10Mbps/100Mbp, self-adaption/RJ45, support Onvif and WIFI 802.11 b/g/n, Power Input: DC12V/1A, Power Consumption: maximum 6w. Need More Information? Call Orwind Support Centre Now @ +91-999-0055-937 / +91-81-3010-7970 / +91-7838-292-696. Plug & Play Outdoor WIFI IP CCTV Cam: Can be set up in minutes. Only for installation you need wired internet, after initial installation works on WIFI. Metal Aluminium case provides it ample protection from all kinds of weather. Rated IP66 Waterproof: If you want security for outside your home or office, this is an ideal camera. It is rainproof and covered cable joints ensure water stays away from the joints. Supports Upto 64GB MicroSD Card (not included): You can install 32/ 64GB microSD card and record the history straight in the MicroSD card. 1080P with 6MM Lens video with 75 degree field of view: Get clear view of what is happening in our outside your office. Motion Detection, Night Vision and much more: This feature rich Outdoor Wifi IP camera sends you notifications if kept on motion detection. This camera captures high quality image at the range of 18 meters/ 58 feet apprx at night with its 12 pcs LED Light. INDIABOOSTERS BY ORWIND SUPPORT AND ASSURANCE: Call us on +91-99900-55937 (9 AM- 9 PM, Mondays through Saturdays) for setup/installation guidance. This product (excluding accessories) comes with 1 year's guarantee against manufacturing defect(s) on production of tax invoice copy and Orwind guarantee card. ORWIND SmartLife Security India | A Brand You Can Trust Blindly. Despite using IP cameras from big brands such as Hikvision, Dahua. Many users choose the ORWINDcameras. ORWIND cameras are very cheap for home use. Their products have occupied a large share in low end market sector. ORWIND cameras are very popular with customers due to their low cost. GwellTimes, the team behind the platform, keeps improving the App’s performance, so we are continuously reviewing this situation and producing different types of camera based on ORWIND platform. Currently, we can produce indoor cube cameras, pan/tilt cameras, outdoor bullet cameras, panoramic cameras. The outdoor WiFi bullet IR cameras in particular are very popular, and frequently recommend them to our customers. 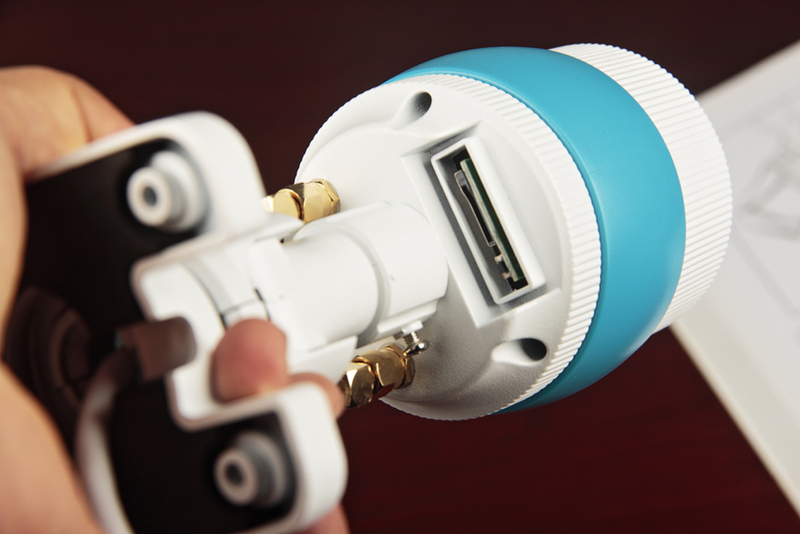 In this article, we are going to write an review for D1601AB. 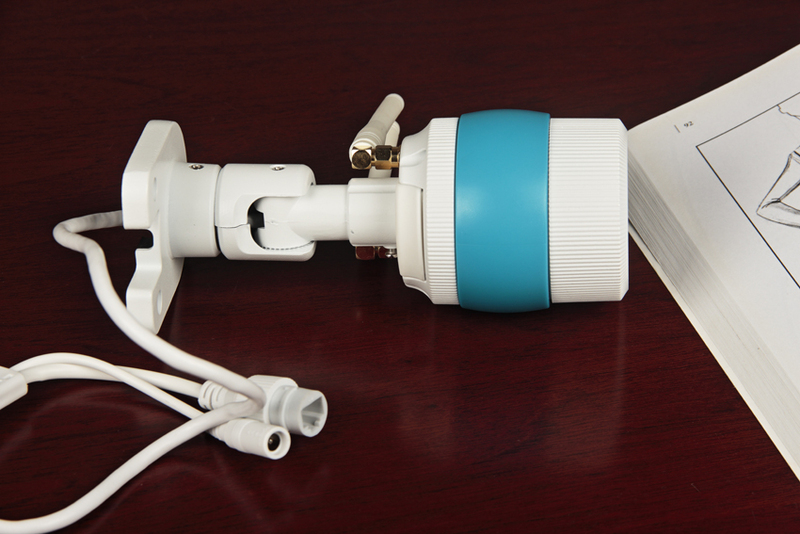 The camera is an outdoor IR bullet camera has two WiFi antennas, the camera adopts waterproof design to offer IP67 protection, therefore can withstand harsh weather conditions to be suitable for both indoor and outdoor installation. Unlike other models, this camera has a TF card slot (max. 32GB) design, yet it’s very convenient to allow users to insert and take the TF memory card out. The camera uses all-metal construction, it feels very solid, it includes a 3-axis swivel bracket, hence users can adjust the camera freely to get the optimum viewing angle. In addition to the WiFi connection, you will see it has a cable with a DC jack and RJ45 port at its end. This means this camera can support both Wi-Fi and Ethernet connection. In terms of video capturing capability, it utilizes a 1/4” progressive scan CMOS image sensor SC1045, SC1045 is produced by SmartSens, which specializes in producing megapixel CMOS image sensors dedicated to IP video surveillance applications. The camera’s processor uses Grain Media’s GM8135S. The image has been carefully tuned to deliver high clarity and vivid color image. The camera is equipped with a 3.5mm fixed lens, it provides approximate 79 degree wide viewing angle. If you are not satisfied with this viewing angle, you can choose the 1.3MP Fisheye Lens Panoramic Camera, which is able to provide you 360° panoramic view. As it’s an IR camera, behind the protection glasses, you can find Infrared illuminators. When camera works in low light conditions, the camera will automatically switch on these IR illuminators, and the IR range can reach up to 10-15 meters. As it has IR-CUT filter, the camera can produce true color image at day while maintaining the highest light sensitivity at night. 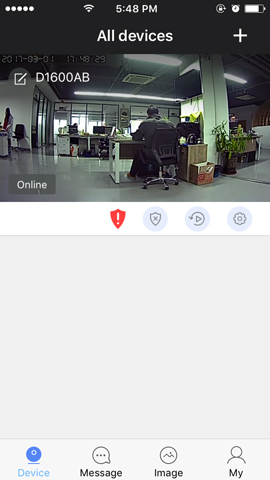 When firstly receive the camera, you may want to setup the camera through its web interface just like you did on other IP cameras. However, ORWIND cameras don’t support setup via web interface. It mainly relies on the App to complete the setup and installation. Foremost, you need to download and run the ORWIND App in your smartphones. As we previously mentioned, the ORWIND App is maintained by Gwelltimes team, the team keeps update the App intending to enrich functionalities and fix bugs, the ORWIND App now becomes very user-friendly. The camera offers three methods to setup, you can simply run a Cat5 network cable from the camera to the router, then manually add it to the App by inputting device ID and password. Or you can reset the camera, then using [Smartlink] to add the camera. Moreover, the ORWIND recently add another [AP mode] to add the camera. 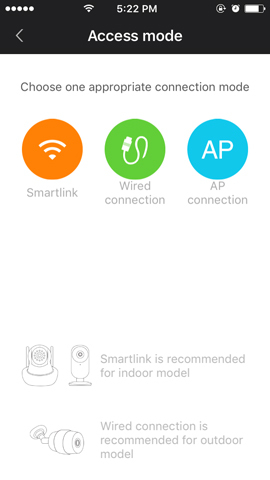 AP, is the abbreviation of access point, when your IP camera is in AP mode, it means the camera will provide a hotspot WiFi, your smartphone can directly connect to this WiFi SSID, then access the camera. AP mode enables users to use the IP camera even there is no Internet connection. To know more about this, you can read my previous article - How to use the AP mode function for ORWIND cameras? It should be noted that all ORWIND cameras currently only support 2.4GHz WiFi, they don't support 5GHz WiFi. Comparing with 5GHz, 2.4GHz WiFi can provide better performance in terms of transmission range, and the speed is sufficient for the data transmission of this camera. DHCP function should be enabled in your router to ensure the setup will be successful. Once it has been added, it will be listed on App. Click the thumbnail image, you can watch the HD video, horizontally rotating your smartphone, the image will scale up to be full screen. Then, you will see many options such as a option to switch different resolution (LD, SD, HD), arm/disarm, mute, intercom, snapshot, video record. Simply touching one of them to achieve the functions you want. If you want to change the camera's settings, for instance, you want to change the date and time, then you can click "Set" icon to proceed. 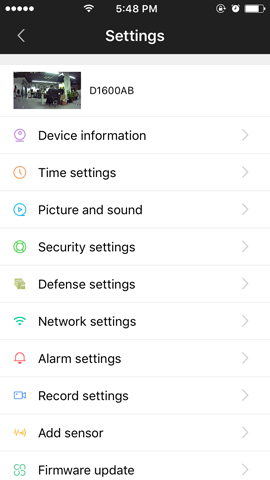 The setting page will list all the settings you can change including time, picture and sound, defense, network, alarm, record and more settings. Lastly, if you wish to upgrade the camera's firmware, you can simply click "Firmware update", the camera will automatically check if there is a new update available, then upgrade to the latest firmware automatically. For those users who wish to access the camera through computers, the camera comes with a free software called CMSClient. CMSClient is a software can be run in Windows XP, Windows 7, Windows 8, as well as the Windows 10 OS. Unfortunately, it doesn't offer software the Mac Computer. Using the CMSClient software, users can manage up to 64 sets of cameras simultaneously. The CMSClient software provides preview, playback, video recording, remote config etc many useful functions. ORWIND cameras are so cheap, many users may doubt on its image quality. The reality is ORWIND cameras can provide a decent quality image due to the 1-megapixel CMOS image sensor. The camera will automatically adjust the camera’s image parameter to fit the changes of lighting conditions, therefore to capture high clarity and true color video. However, the IR night is a bit disappointing, as it can’t not allow users to manually switch on/off the IR illuminators. 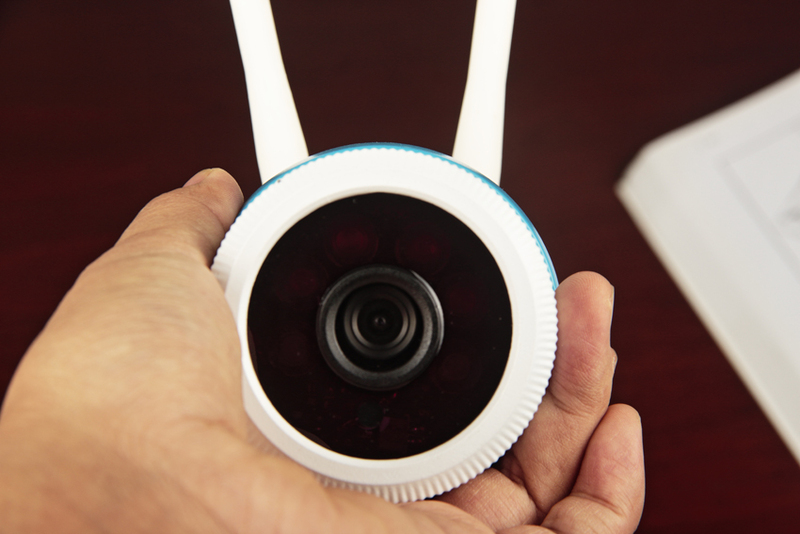 In many cases, for example, some users want to use the camera as a baby monitor, therefore don’t want to the camera to switch on its IR LEDs even working under low light conditions. The equipped lens is 3.6mm, which gives the most wide-angle view, however there is significant barrel distortion, especially towards the edges of the frame, resulting in a significant fish-eye effect. This will no doubt be less severe with the longer focal lengh lenses (e.g. 8mm, 12mm). This is a good outdoor IP WiFi camera for home use, at the bottom low price. It supports hassle-free setup and installation, the image quality can compete the similar models from Hikvision and Dahua. Its TF card slot design is great since users can insert or take out the TF memory card without opening the camera’s housing.